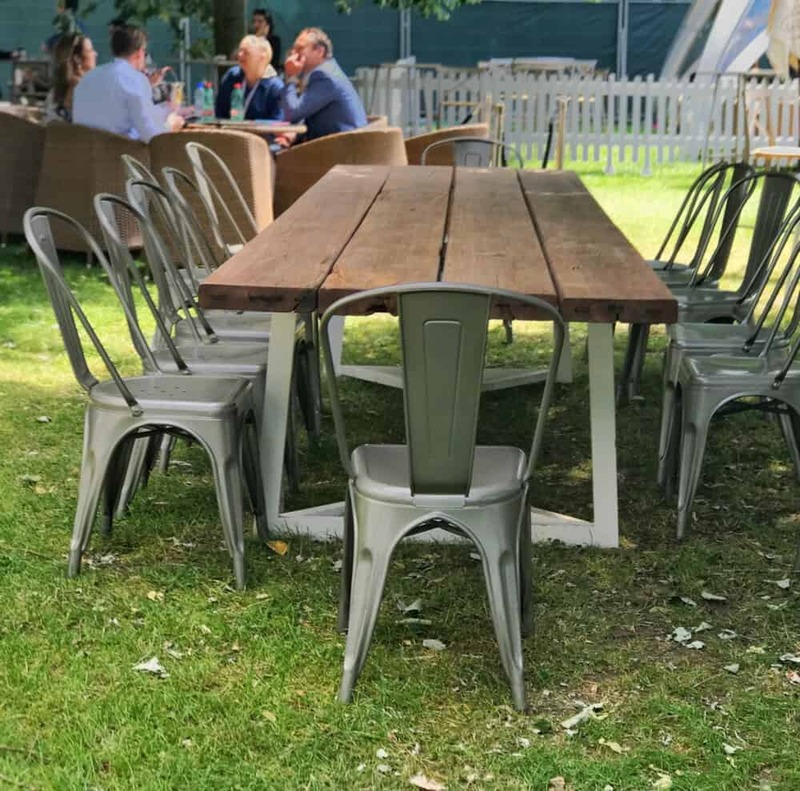 Another summer in London, another Taste of London festival in Regent’s Park. 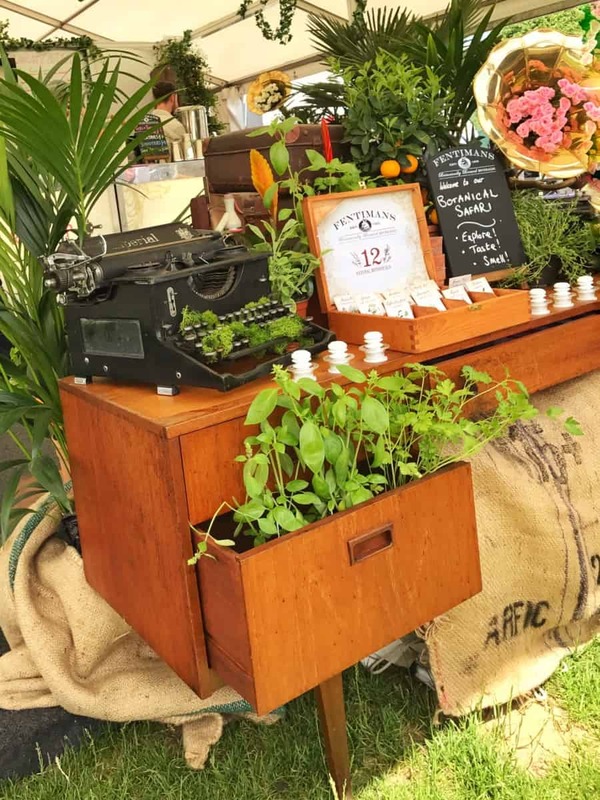 This London Food Festival has been a fixture in the city’s summer calendar since 2004. This year we felt the festival was smaller than in previous years. There were a lot of Spanish restaurants this year because the festival coincided with the third World Tapas Day. Many of London’s best restaurants which had appeared in previous years did not make an appearance. Maybe the Taste of London’s festivals organisers were trying to mix it up a bit. My husband always (and I mean always) has the foie gras burgers from Opera Tavern. Good thing he wasn’t there this year because some of his favourite places such as Opera Tavern and Sushi Samba did not make an appearance. Never mind. The sun was shining, the alcoholic iced-tea was freely flowing and the food was delicious. Little plates mean you can try lots of different things. 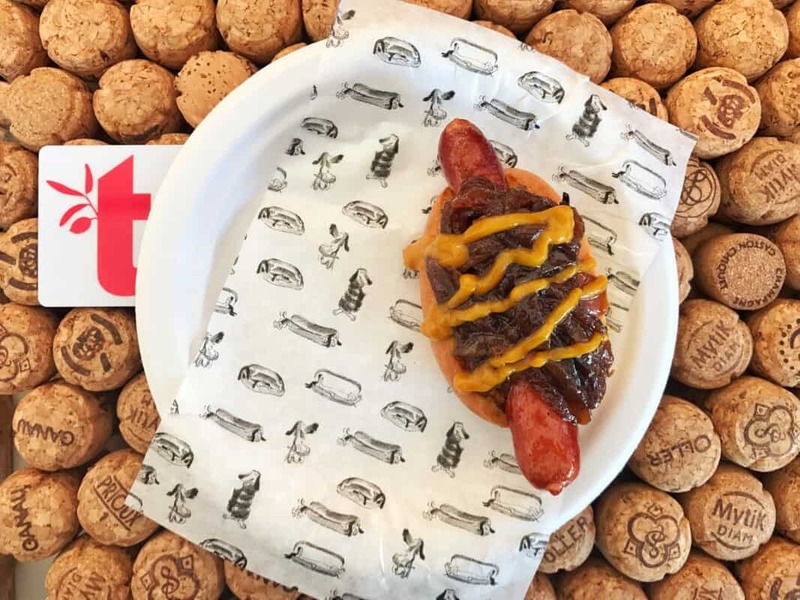 Bubbledogs serves up gourmet hot dogs and champagne. They even have their own-label champagne. 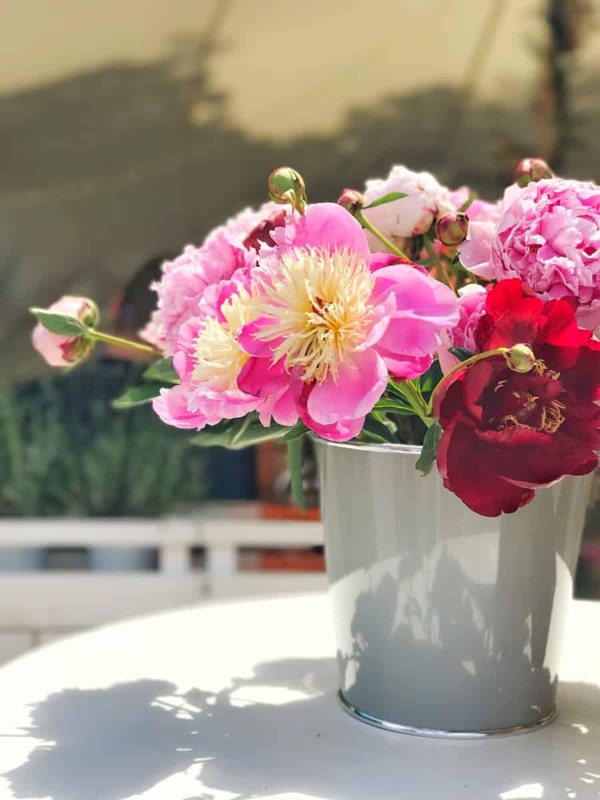 It’s a perfect treat for Sunday brunch with the kids. 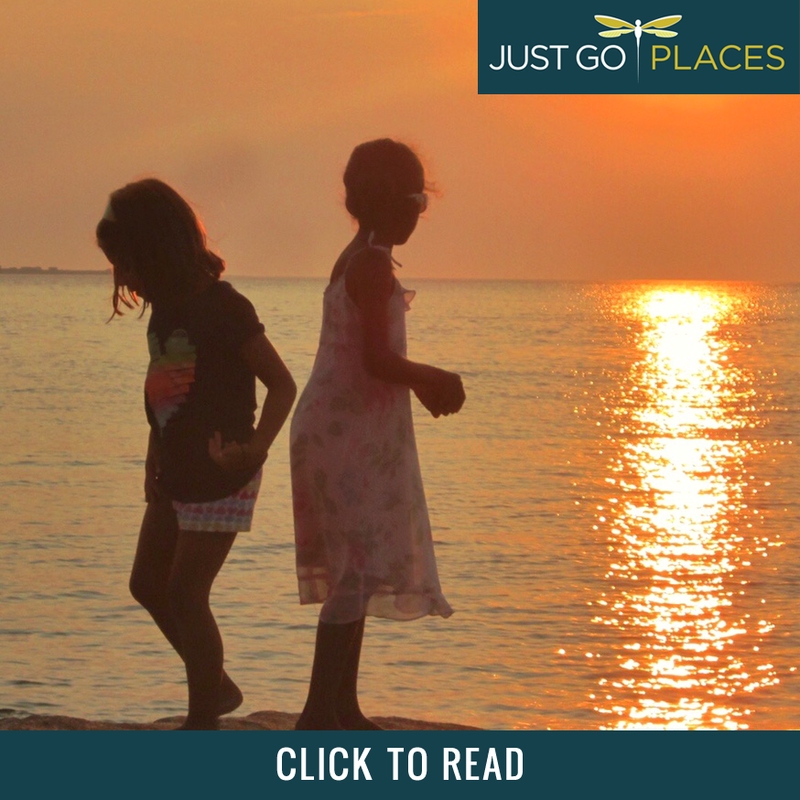 Parents hang out with the bubbly and the kids scoff hot dogs. Win/win really. This beauty had a twin which I scoffed before I realised I really should have taken a photo of it. 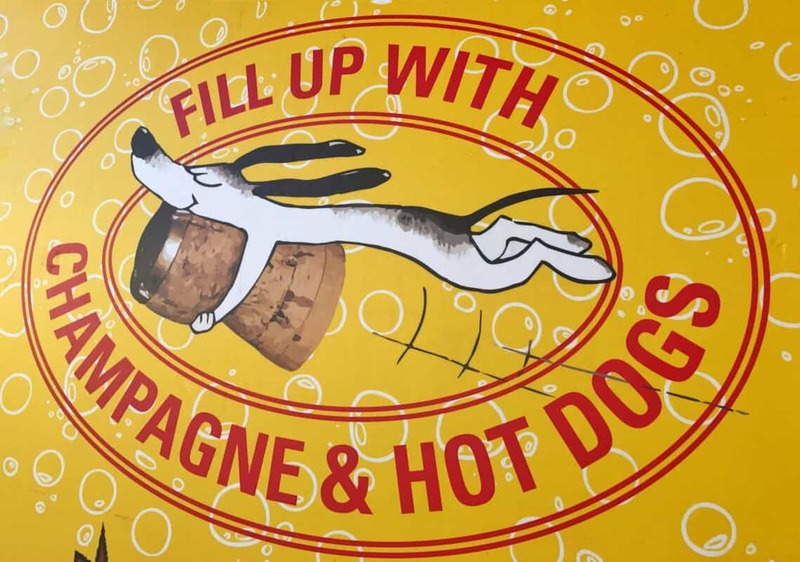 Why yes, champagne and hot dogs go together like… champagne and hot dogs. The Spanish Basque country stall was selling pintxos (or pinchos) and wine. Pintxos are a relative of the better-known tapas. They are small bites which are skewered together with a little toothpick onto a small slice of bread. 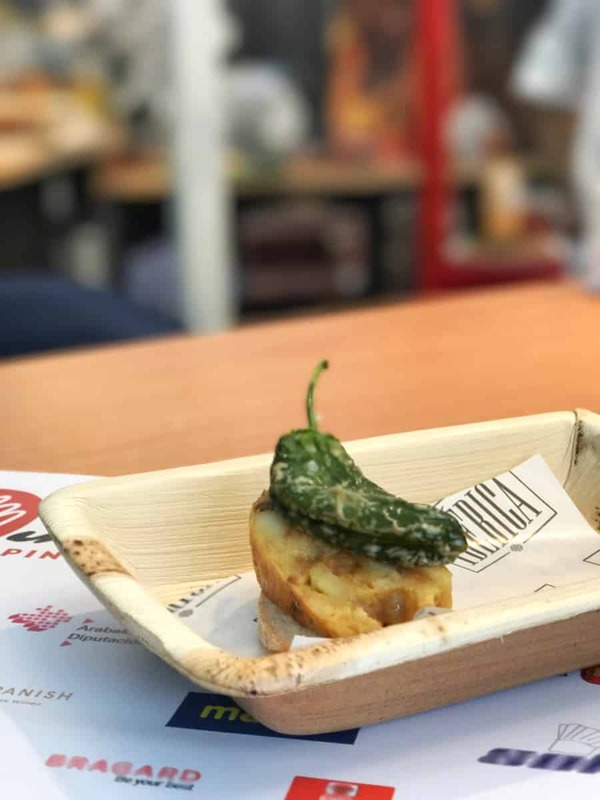 This pintxo was made up of a Spanish tortilla and a grilled pepper skewed onto a slice of bread. 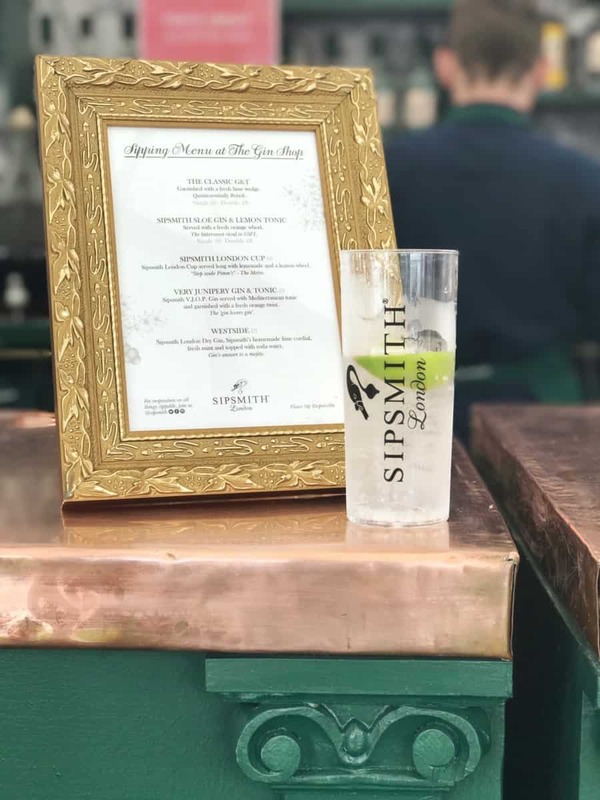 Sipsmith are London-based gin distillers who served up a mean gin & tonic (in several varieties). They were ahead of the gin trend setting up the first copper pot distillery in London in a couple of hundred years. I loved the gin AND the copper bar at Sipsmith. Sitting in a London park, drinking a G&T, could there be anything more English? I think Pimms would say yes. I do love a glass of Pimms in the summer as do my other American friends. 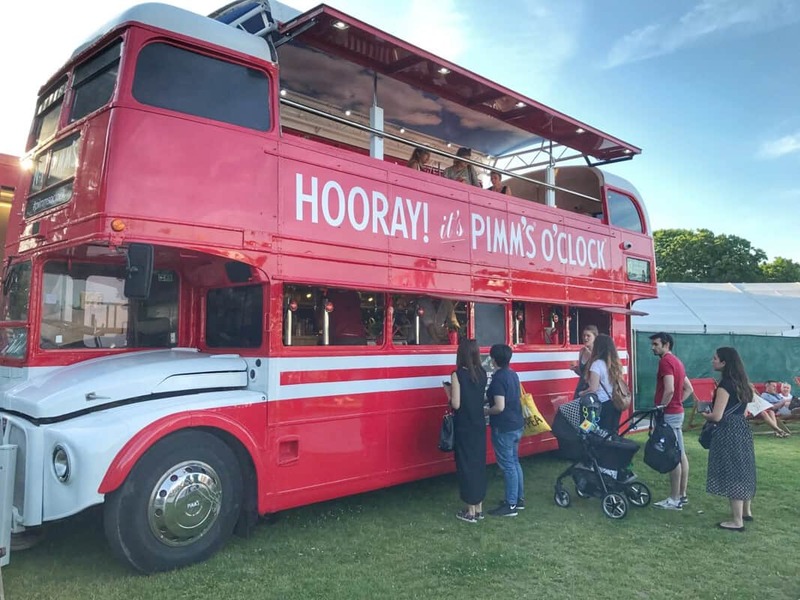 A retro London bus serving up Pimms is hard to miss. 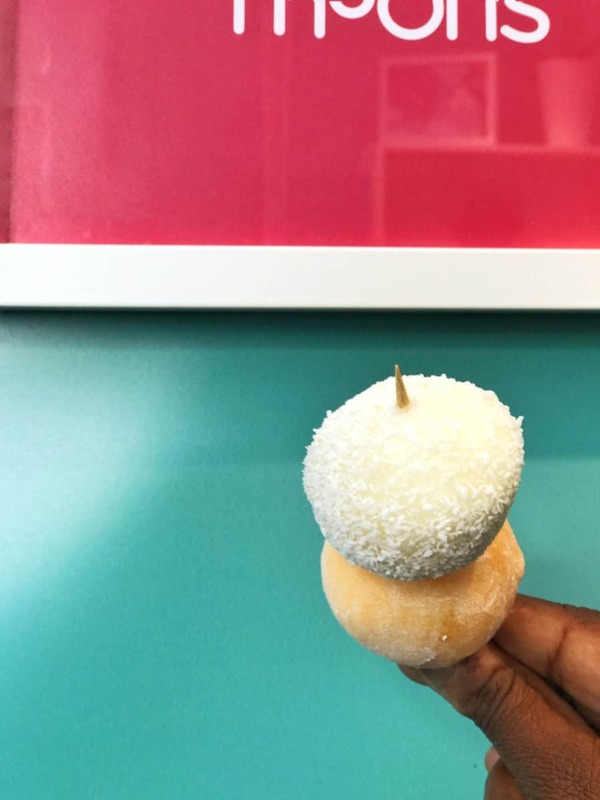 These two Mochi ice cream balls from Little Moons are coconut and mango. The marquees provided shelter from the intense sunshine. These chairs were surprisingly more comfortable to sit in than they looked. 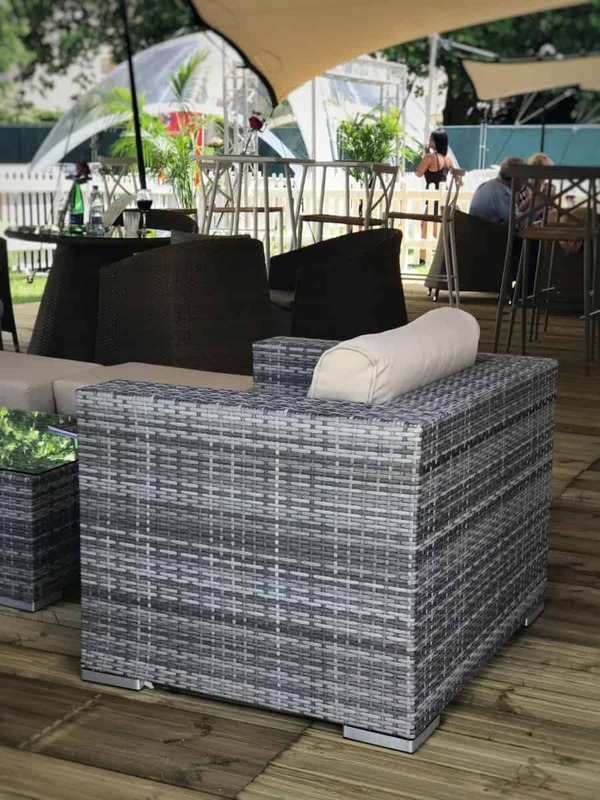 The VIP Area had the comfortable seats and trendy wicker furniture. 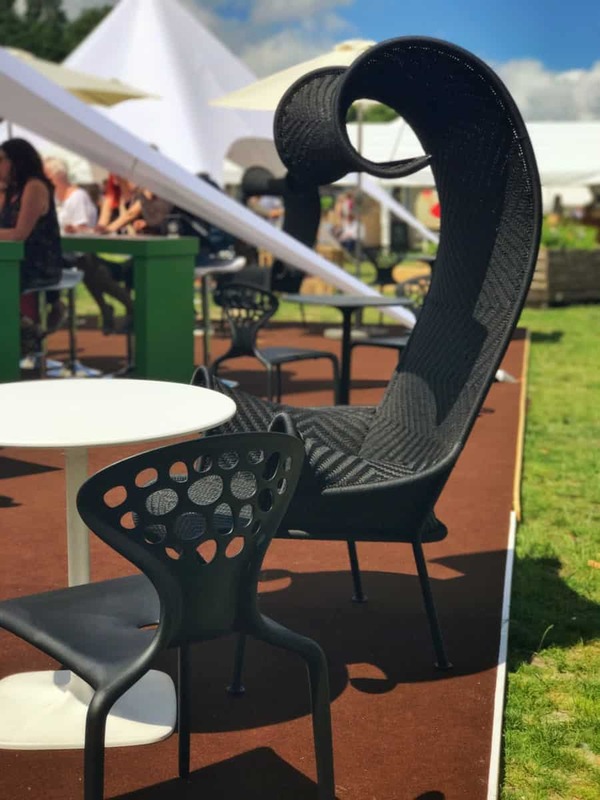 What would a hip festival be without artfully styled (i) midcentury modern furniture, (ii) greenery and (iii) a typewriter. 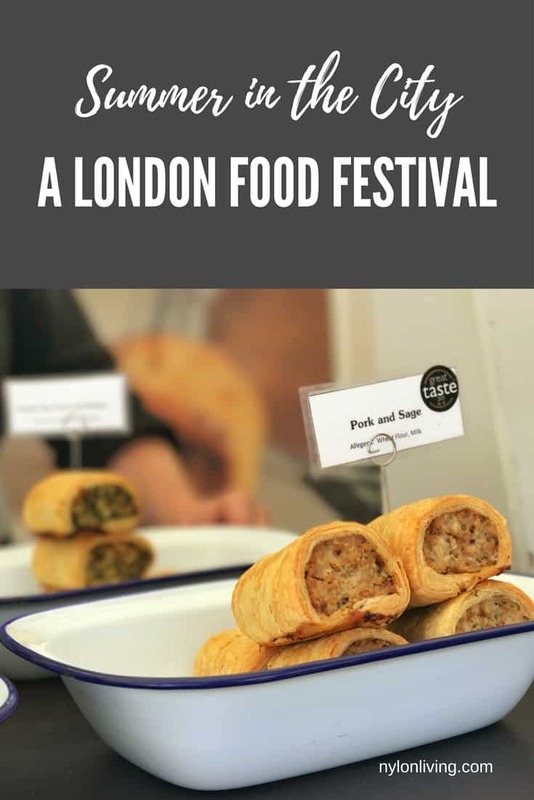 If you are in London in June for this London food festival, I highly recommend you visit. You can get tickets online or at the door. 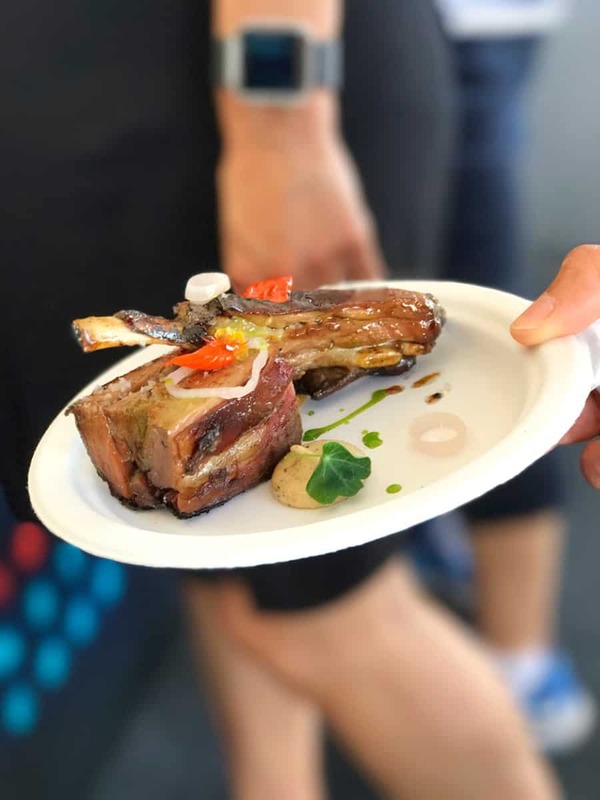 You will be able to sample some of the best bits of London’s food scene in a short period of time. There is a Taste Card which you can buy and fill with money which allows you to be cash free at Taste of London. This cash-free policy did not seem universal though because many places accepted cash and/or card as well.